Pinterest, the rapidly growing social networking site that allows users to post and share images and videos on "pinboards" (a collection of "pins," usually with a common theme), is providing businesses and savvy entrepreneurs with a new platform to market their products and services. And, as with any new platform, learning what works best and what doesn't when it comes to marketing can be a challenge. 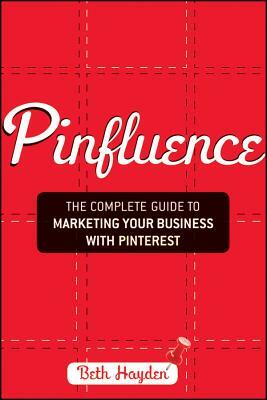 Pinfluence is a complete guide to Pinterest marketing that will teach you how to effectively raise awareness for your brand, product, or service, drive traffic from Pinterest to your website, and connect with current and potential customers. Advanced Pinterest marketing techniques, including how to grow your audience, how to use the Pinterest iPhone app, advice for special types of businesses (B2B companies and nonprofits), and how to make your pins and boards "sticky" so they capture public attention and influence people to change their behavior. BETH HAYDEN is a nationally known speaker and social media expert, and founder of Blogging With Beth. She regularly contributes to the web's top social media blogs, and her featured post on Pinterest marketing for Copyblogger.com is one of the site's most shared posts. Beth frequently speaks about blogging, content marketing, and Pinterest at conferences and events across the country.